The majestic cycle of Pinter shorts comes to a fulfilling climax in the pairing of A Slight Ache and The Dumb Waiter, two one act plays about external threats and forces destroying the routine of everyday life that form Pinter 7. 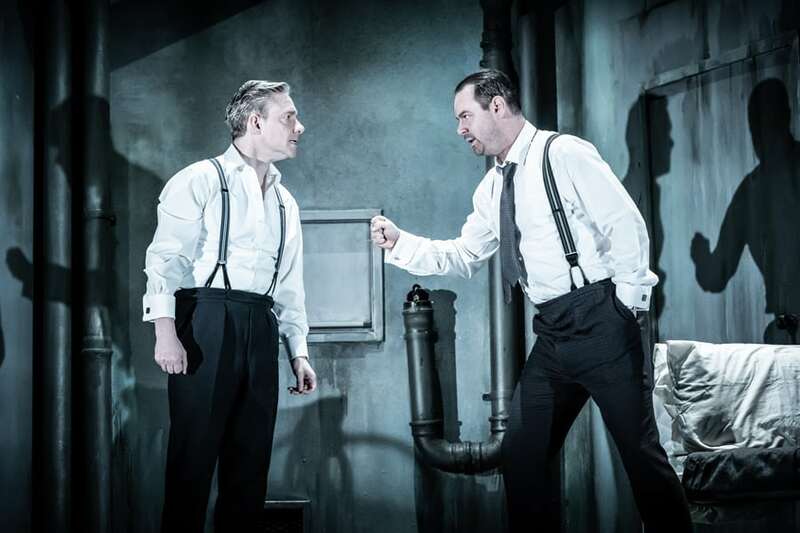 Much media attention has focussed on the pairing of Danny Dyer and Martin Freeman in The Dumb Waiter, and that has perhaps taken focus away from what turns out to be, for me, the jewel in the crown of the season, A Slight Ache. 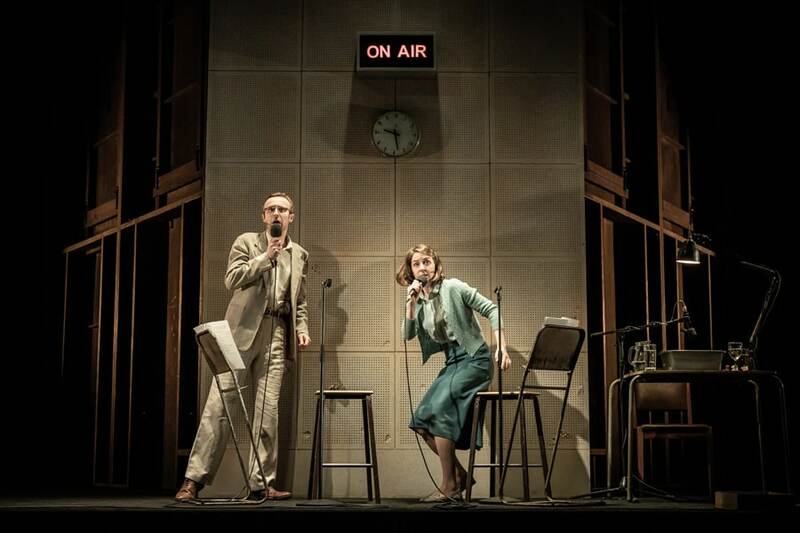 Jamie Lloyd’s genius direction takes the play back to its original radio broadcast, staging it as a recording of a radio play, beginning with voices beautifully modulated into microphones, sound effects and music. Gradually though, the actors move away from scripts and microphones until its final, gripping end. It’s a normal day for Flora and Edward, the longest day of the year, and their garden teems with flowers and nature. A wasp trapped in the marmalade becomes a metaphor for their trapped lives- who is the Matchseller at their back gate? Not the front, where he would actually sell some to passing trade, but he has been there for weeks in all weathers. Flora welcomes him, Edward is threatened by him and they invite him into their home. Who and what does he represent? Gemma Whelan and John Heffernan are outstanding as the couple, she perfecting a crystal cut English accent reminiscent of Royalty, he flustered yet educated, wearing his intense research interests on his sleeve. The entire season has reminded us how funny Pinter is, and the couple land every punch line perfectly. As the Matchseller is an invisible role, there is joy as his description is revealed in gradual steps, “You look rather hot. Would you like to take your balaclava off?” Of course, things turn sinister as Flora remembers being raped by a poacher and wonders whether this is that same poacher, and Edward recalls how he used to look much like the Matchseller, until he got where he is now. Perhaps the Matchseller is dormant sexuality as Flora’s reawakens, he naming of the flowers in her garden dripping with succulent sexuality at the end. Perhaps he represents the homeless and what happens if we invite strangers into our homes- The Matchseller is a silent prototype of Davies the tramp in The Caretaker. The recording light switches off, but the play continues until Flora takes Barnaby, who she has named the Matchseller, upstairs and Edward appears in the costume described to sell matches. It is sinister, gripping, superbly acted and worthy of the highest accolades. However, The Dumb Waiter does not disappoint. In a grimy basement, assassins Ben and Gus await their next job. There is a lot of waiting in Twentieth Century theatre, and Ben and Gus are Pinter’s Vladimir and Estragon, their Godot is their boss, the unseen Wilson. While they wait for instructions, Gus looks inside his shoes and finds flattened matchboxes, Ben reads out articles from the paper, the toilet flush is poor and the minutiae of daily life is captured perfectly. In a nice touch, the first envelope shoved under the door contains matches, a good pairing of plays indeed. The instructions are sent down to them via the dumb waiter- but they are orders for food. The pair make a perfect comedy duo, Martin Freeman’s reading out of the food orders is hilarious- the word scampi has surely never got such a big laugh. Danny Dyer eschews his hard man image a little and plays the seemingly more sensitive Ben, pulling rank as the superior and getting Gus to act first. His performance is a touch too mannered, but perfect for the role. There is a discussion that their previous hit went wrong, and a girl was killed, and there becomes an awareness that they are being punished for this error as the food orders escalate and they sacrifice their own tea and goods to satisfy the Gods above. By focussing on the comedic side, tension has been sacrificed a little, there is no strong sense of menace and, having seen the play several times, the pace of this version seems fast, it feel disappointingly short. However, Dyer and Freeman are a fine pairing and they bring the season home in triumph. This has, no doubt, been one of the theatrical events of recent years, a real once in a lifetime opportunity to see rarely performed Pinter. And the actors have been magnificent, although I have pondered if a smaller ensemble may have brought even more out of the work- I would have loved to have seen some of the earlier casts, Russell Tovey, Tamsin Greig, Maggie Steed and many more, return to play different roles. But the range and quality of the actors has been astonishing, and Jamie Lloyd has confirmed himself as a superlative interpreter and re-interpreter of Pinter. And it’s not over yet, with the “unofficial Pinter 8”, Betrayal, opening next month!